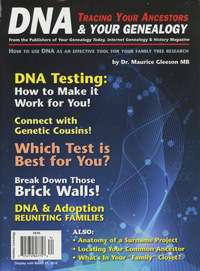 This 66 page DNA guide is the most easy-to understand published to date. Heavily illustrated, this guide is for the rest of us! What Companies offer DNA tests? What can you get from a DNA test? How much DNA do I share with my relatives? Step 1 - Where does the common ancestor sit on your tree? Step 2 - Is the common ancestor obvious? Step 3.1 - Maternal or Paternal ancestor? Step 3.2 - A match on the X?